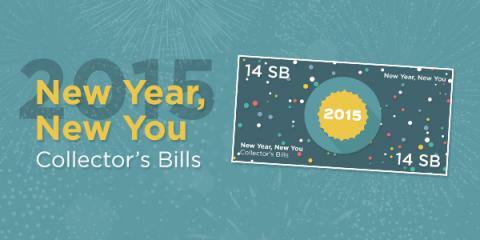 Swagbucks' celebration of the New Year continues with a set of exclusive "New Year. New You" Collector's Bills. They're a set of five unique Swag Buck bills that you win exclusively through their Search feature. Starting January 12th and running through January 19th, if you win all five bills, you'll get a bonus of 15 Swag Bucks automatically added to your account. If you want to track which bills you've won, just go to the "My Swag Bucks" area of your account and click on the "Collector's Bills" tab. Quick tip: If you default your browser's search engine to Swagbucks, you won't miss any opportunities to earn those bills! P.S. I use SwagBucks all the time and this is one of the ways that I can get stuff for FREE! If you haven't joined Swagbucks yet, click here to start earning free gift cards.